With enhanced functionality in Excel Services and PerformancePoint Services for SharePoint 2010, you can manage your business data more efficiently, and monitor and analyze business performance against goals more easily. Access the commands and tools you need all in one place. Perform actions on pages, documents and lists using only the commands you need, and in the context of what you are doing and for the task you want to accomplish. More than one person can edit a Word document or slides in a SharePoint library at the same time. For example, to review a document you can send a link to the document in a SharePoint library, and all of the reviewers can provide their feedback in the document simultaneously. No more attachments—you can, for example, store all of your recent documents in your My Site and work on them at the same time with other colleagues. 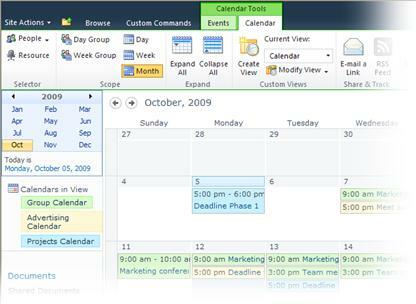 Display multiple SharePoint and Exchange calendars on a single page. Easily add events to a calendar by clicking a date and entering details for the event without leaving the calendar. Drag and drop items within a calendar. Use the new Group calendar to schedule meetings with colleagues and schedule resources such as audio visual equipment and meeting rooms. Insert and format content directly on the page with the new Rich Text Editor. Browse for images or photos on your local computer or network and insert them into your site without leaving the page you are on. Now you can select multiple items in a list and click a button to perform the same action on all the items at the same time. For example, you can check in or check out several documents at the same time. Use the new Rich Text Editor to more easily and intuitively author your blog posts. Browse for images or photos on your local computer or network and insert them into your blog posts without leaving the page. Browse blog entries by month as well as by categories. You can see the number of posts for each month or category in real time. A new Archive link provides access to a view of all months since the blog’s inception and, within each month, posts are listed by category. With SharePoint Web pages optimized for viewing on small devices, you can now view and work with documents, blogs, wikis, back-end business data and sites from your mobile phone. Listed below are some of the new mobile features in SharePoint Server 2010. Use the lightweight interface and navigation for accessing SharePoint document libraries, lists, wikis, blogs, Web Part Pages, and back-end business data. Use the mobile search experience for finding people, contact information, SharePoint content, and finding data in custom databases. Subscribe to text message (SMS) alerts for changes to documents in SharePoint or to any SharePoint document library or list. View Microsoft Office Word, Excel, and PowerPoint documents in mobile browsers. Integration with gateways such as UAG, ISA for cross firewall access. Provide a mobile development platform to build custom SharePoint mobile solutions beyond the out-of-the-box mobile experience. With the new features in SharePoint Server 2010 you can locate content and stay informed about people and areas of interest that matter most to you. New features include newsfeeds, social tagging, and ratings so that you can more easily keep track of your colleagues’ activities, as well as share relevant content. Improvements to My Sites help you use your My Sites and profiles to share knowledge in your specialty area with your colleagues. 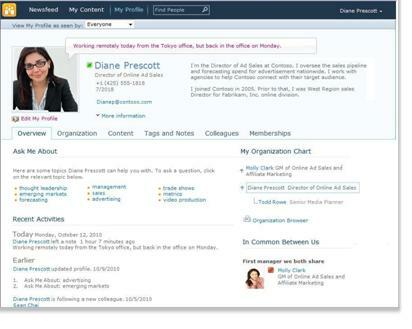 Adding interests and responsibilities to profiles makes it easier for colleagues to find each other through newsfeeds, ask and answer questions, and to connect in other ways. The new enterprise content management features in SharePoint Server 2010 enable you to manage documents, records, digital assets, and published Web pages more efficiently. Publish and share content types across site collections and Web applications. 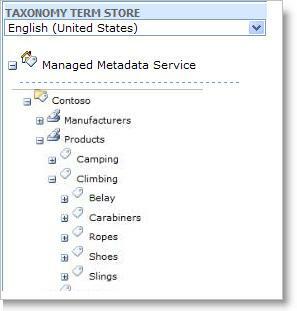 Use the Term Store to manage terms and taxonomies. 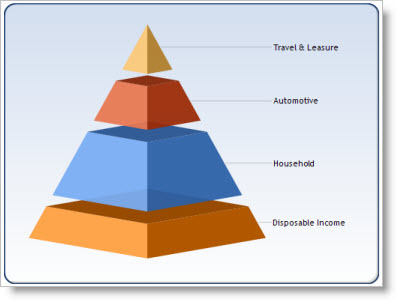 A taxonomy is a hierarchical organization of terms. Users can apply these terms to content on your site if you add the new managed metadata column to lists, libraries, or content types. Taxonomies and terms can be centrally managed within your organization, or you can integrate managed metadata with social tagging and enable users to suggest terms when they tag content. SharePoint Server 2010 introduces document sets, which are a new content type that enable you to create and manage work products that span multiple documents. Document sets are configured like other content types. They can be set up to include a set of default documents that people then customize when they create a new instance of a document set. Document set features such as shared metadata, workflows, and versioning enable groups to manage the development of a work product or content set efficiently. A common example of a document set is a "pitch book" used by a Sales and Marketing team to group different document types together for a product promotion. The updated Document Center site template enables new document management features for a SharePoint site, including the new metadata-based navigation feature. With this feature you can browse content in a large list or library by using metadata rather than by folder location. Unique document IDs make content easy to find regardless of its location. In-place records management that enables you to store records in place next to in-progress content. For larger archives, the Records Center site has been improved by the addition of a hierarchical file plan, submission methods driven by metadata, and the ability to band together multiple site collections that can be managed as one large repository. 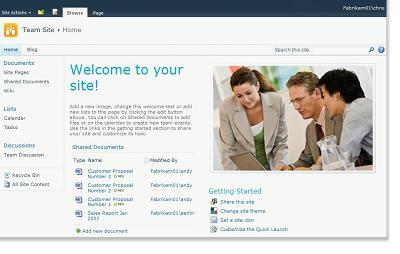 New and improved Web Content Management features make it easier to publish Web pages and manage sites. In addition, SharePoint Server 2010 now includes support for streaming video. The Web content authoring experience has been improved and simplified with the addition of the ribbon, which consolidates page commands and makes commands more task-based. Improvements to export behavior as well as logging and reporting make content deployments easier. Out-of-the-box Web Analytics features provide support for Traffic, Search, and Inventory analytics reports. New support for rich media includes a new Asset Library, with rich views and pickers; support for videos as a SharePoint content type; a streaming video infrastructure, and a skinable Silverlight media player. Large page libraries simplify the management of Web sites with many pages. Creating and managing different versions, or "variations" of publishing sites or pages is an operation that is now submitted to a queue and occurs in the background so users can continue working in SharePoint while the operation completes. A View Changes command has been added that allows you to compare an older version of a Web page with a more recent one. Changes are highlighted in a special report to enable side-by-side editing in the Rich Text Editor. Refinement: helps to inform you about results and allows you to narrow result by specific types such as site, author, or date. Pre-populated query suggestions, related search links, and acronym expansion. Ability to query for documents by using Boolean syntax (AND, OR, and NOT), and prefix wildcards (*). Ability to search SharePoint content from a computer running Windows 7. Improved “Did you mean?” to support more languages and terms within your enterprise. Search for a person by expertise to find someone who has the skills that match your needs. Use the phonetic name lookup to find similar sounding names (is it John or Jon?). 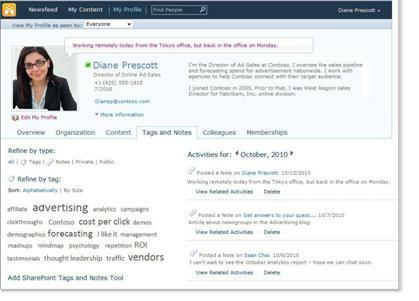 Refine search results by using categories such as department or job title. The search model uses the properties (or metadata) that you or your computer provides on documents. Search now combs the content for key phrases that might locate missing or inaccurate properties, which helps improve relevance. Site searches are automatically scoped to the current site and its subsites rather than all sites. 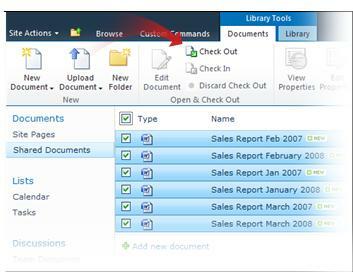 You can quickly view, add, edit and delete SharePoint library documents or list items while you are offline. Two-way synchronization between your computer and the network—that is, updates to data on your computer or on the network—are automatic while you are connected to the network. Content is automatically synchronized when you take your computer offline and then go back online. Several new features related to permissions management, site design and an international user interface optimize how you can use, design and access SharePoint sites and content. New permissions management is available from every site collection, site, list or list item, so that you can easily add or remove users or groups, change permission levels, break inheritance, and manage anonymous access. 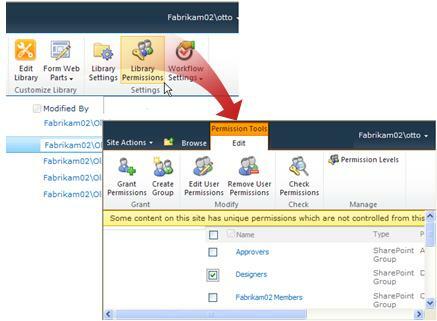 In addition, you can view and adjust all permission levels granted to a particular user or group. 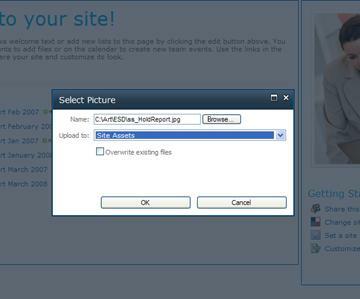 Use the new Themes Gallery to select from several themes included with SharePoint Server 2010. You can also generate your own theme files from Microsoft PowerPoint and add them to the gallery for selection. With the appropriate language packs installed, you can view settings pages, Help, and application content such as list titles and column names in your preferred language. SharePoint Server offers more robust business intelligence capabilities through enhanced functionality in Excel Services, PerformancePoint Services, and Business Connectivity Services (BCS), a SharePoint-based framework that provides standardized interfaces to existing business data and processes. Improved features for visual data analysis, such as enhanced conditional formatting, sparklines, and intuitive data exploration by using filters. Tightly integrated client functionality with the PowerPivot for SharePoint, a new “self-service BI” feature from SQL Server Analysis Services. The ability to analyze millions of records quickly and easily. New formatting and editing capabilities that enable you to edit and format spreadsheets directly in the Web browser just as you would in Excel. 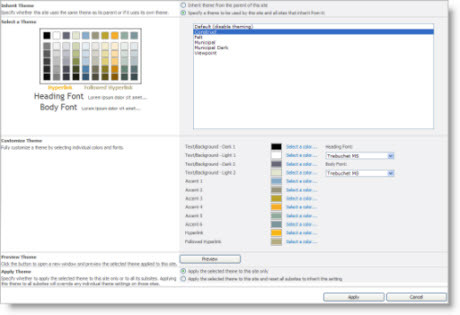 You can now apply color, style and size formatting to lines, borders, and numbers, and use the same background color features that you know from Excel. Browser-based creation of new workbooks, and tables in workbooks. The new Chart Web Part, based on Dundas data visualization techniques, enables you to add rich charts to your SharePoint sites by using Web-based configuration to connect charts to data from a variety of sources, such as SharePoint lists, external lists, Business Data Services, Excel Services, and other Web Parts. PerformancePoint Services makes it easier to monitor and analyze performance against goals and make better business decisions. Create and use interactive dashboards with scorecards, reports (including Reporting Services and Excel Services Reports), and filters. Create and use scorecards that bring together data from multiple data sources (including Analysis Services, SQL Server, SharePoint lists and Excel Services) to track and monitor your data. Use powerful analytic reports to identify driving forces and root causes, and apply filters to personalize your reports. Integrate your business intelligence applications and information with other powerful SharePoint features, such as collaboration and content management. 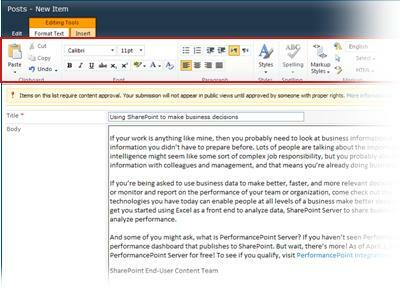 PerformancePoint Services enables you to manage and secure your PerformancePoint content in SharePoint Server 2010. PerformancePoint Services takes advantage of SharePoint Server scalability, collaboration, backup and restore, and disaster recovery capabilities. Dashboards and dashboard items are stored, managed, and secured within SharePoint lists and libraries, providing you with a single security and repository framework. Enhanced scorecards make it easy for you to drill down and quickly access more detailed information. PerformancePoint scorecards also offer more flexible layout options, dynamic hierarchies, and calculated Key Performance Indicator (KPI) features. Using this enhanced functionality, you can now create custom metrics that use multiple data sources. You can also sort, filter, and view variances between actual and target values to help you identify concerns or risks. Enhanced analytic reports support value filtering, new chart types, and server-based conditional formatting. The unique visualization Decomposition Tree, a new report type available in PerformancePoint Services, enables you to quickly and visually break down higher-level values so you can understand the driving forces behind them. More easily define external content types—previously referred to as “entities”—by using SharePoint Designer’s visual interface, without using an XML editor. Connect to a wider range of data sources—relational databases, SAP, Web services, and custom applications—and interact with them in richer ways, including full create, read, update, and delete support. Use rich client extensions to build a SharePoint application and extend it to Office client applications such as SharePoint Workspace, Outlook and Word, so you can work with your external data offline. Stronger integration between InfoPath, Microsoft SharePoint Designer 2010 and SharePoint Server 2010 enable you to more easily customize SharePoint lists, views, and workflows. 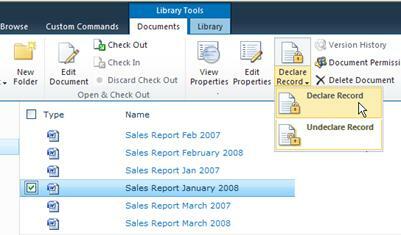 InfoPath can now be used to fully customize SharePoint’s list forms. You can change the look of the form, switch to multi-column layouts, break the form into sections, validate the information entered, pre-populate fields, and cause sections of the form to show and hide automatically. From any list, click the Customize Form command on the ribbon to launch InfoPath. After customizing the form, publish the form back to the SharePoint site to replace the default form. All standard views of list items in SharePoint Server 2010 now use the customizable XSLT list view Web Part, making list view customization in SharePoint faster and easier. From SharePoint Designer 2010, you can quickly apply custom styles to SharePoint’s list views and conditionally format rows based on their content. SharePoint Designer 2010 can now be used to fully customize the "big three" workflows in SharePoint—the Approval, Collect Feedback, and Collect Signature workflows. Workflow capability has been expanded with new actions such as the rich pre-built approval actions. Reusable workflows can be designed once, and then reused across multiple lists, document libraries, or content types. The SharePoint Designer 2010 user experience has been completely redesigned using the ribbon, creating an experience that’s simpler and more familiar to people who use Office.